Mrs. P aka Malynda Jarrett owns a delightfully sweet business in downtown Hutchinson, Kansas where she offers a variety of sweet treats including cupcakes and baked cookies with “Flavor of the Month” treats added. She also decorates a limited number of cookies each week with a different design and/or theme, sold individually. In addition, fun classes and parties include a Spa Night on a Friday evening, a Cookie Decorating Workshop on a Saturday afternoon, or private parties to celebrate birthdays, showers, bachelorette, holiday, and/or corporate events. Years ago, Malynda’s dad introduced her to a retro diner themed ice cream parlor in Branson, Missouri. As she raised her children, she took them to this sweet spot many times. The desserts were memorable, and the retro diner atmosphere was exciting. As a Hutchinson native, she had a dream to open something similar in her hometown. That dream has become reality in her shop at 29 S Main Street in Hutch. It’s a place where you can make moments sweet! When she was ready to go forward with a website, she realized that having an impressive web presence is important to her customers, and she decided upon a fun retro diner theme. She also wanted her customers to view photos of her delectable treats as well as sign up and pay for classes and parties. We brainstormed styles and options, and I then I went to work to create her dream website. Honestly, developing this particular site was the most fun I’ve had so far. And the best reward was her reaction to seeing it for the first time — tears welled up in her eyes! 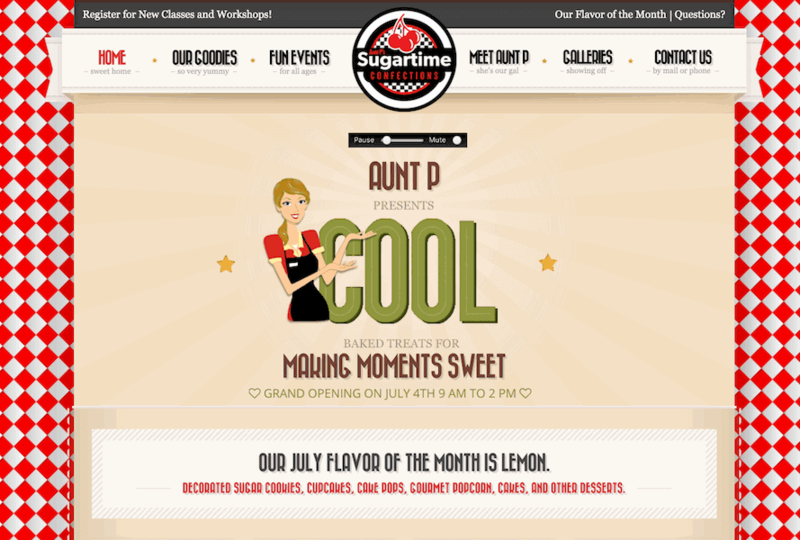 I think we achieved all of our goals with the website for Sugartime Confections. Check it out, and if you live in the Hutchinson, Kansas area, stop by the shop at 29 S Main, buy some yummy items, and even sign up for a workshop or party!